Drew Fox Brewing was invited by Bord Bia to attend the drinks event “Spirit of Sharing” at the Irish Embassy in London on March 9th, 2016. Ambassador Dan Mulhall and Bord Bia hosted twenty Irish producers of premium Irish spirits and craft beers at the embassy. 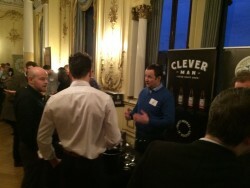 Malcolm was delighted to bring our range of Clever Man Beers to London. It was a great opportunity for the brewery to sample our beers to UK trade & media. It was the first time Clever Man Beer was introduced to the UK Market. We were delighted with the event and the contacts that were made. As Wexford Food Family members it was another great platform for us to showcases the brewery and what Wexford has to offer as a food destination in Ireland.